I'm currently on the quest for my collar bones. I know they exist. I just don't know where they are. I successfully haven't had any fried food in a week. I''ve only punched 3ish people and they seem to be recuperating quite well. I'm not being 100% awesome by any means with this diet life change but I'm taking baby steps to get in the habit of being healthier. I'm failing miserably it seems. I feel like I should be updating you on wonderful celery recipes, and telling you how much water I drank to feel full by now but I'm struggling. Luckily I've been able to resist them. I want one so badly. But I also want to see my collar bones. Some days I 'm able to resist all temptation then others I find myself eating Frito's like a zombie in my kitchen without even thinking about it. I have a lot of support and I'm really thankful for it. I just love food so much. Everything about it is wonderful. It's what I look forward to. It's a constant battle. One I'm ready to be done with. But I'm going to remain steadfast in me not eating the cinnamon goodness that is in my kitchen. 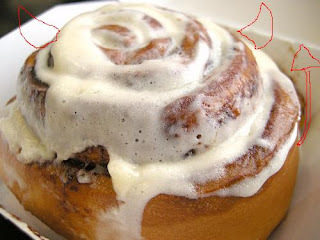 What the... Who put a gigantuous cinnabun in your kitchen??? Was there a string attached to it, because that mess is a freakin' TRAP, Jones. Seriously though, that's just not fair. Like, what if you were Tiger Woods. Would his family just bring home a slutty white chick to lay on the kitchen counter? I THINK NOT. Okay, I may have gone too far there, but I think you know where I'm going with this. Dear Jones family-- please stop tempting Ashley with sugary goodness. It's already hard enough what with the tv and grocery stores and tummy grumbles. If it makes you feel any better, I can't eat sugar or carbs or alcohol for my medical reasons, and it's driving me crazy. I don't know why that would make you feel better, but it's something people say. I'm not trying to steal your thunder, I swear. I just empathize. Why is eating so fraught with complications?! i enjoy this no fried food approach. i shall jump on the band wagon as swell. Robyn, you're the best! I'm learning food just isn't a struggle for me. It's some how comforting in a weird way. Kristin, you can do it. You only have like 3 rage blacks per day.